An hour-long (and then some) conversation with David Weber, author of the Honor Harrington science-fiction series, which this episode focuses on, and many others, including fantasy (Oath of Swords, The War God’s Own) other space opera (Path of the Fury, The Armageddon Inheritance) and alternate history (1632 series with Eric Flint). David Weber was born in Cleveland, Ohio, but moved to Greenville, South Carolina with his family by the time he was two. Some of Weber’s first jobs within the writing/advertising world began after high school, when he worked as copywriter, typesetter, proofreader, and paste-up artist. He holds a Master of Arts in history from Appalachian State University in Boone, North Carolina. Weber’s first published novels grew out of his work as a wargame designer for the Task Force game Starfire. He wrote the Starfire novel Insurrection (1990) with Stephen White. This book was the first in a tetralogy that continued through their last collaboration, The Shiva Option (2002), which made The New York Times Best Seller List. 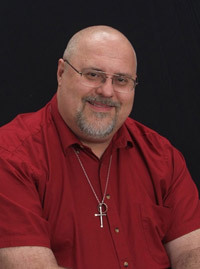 His most famous series is the Honor Harrington series, but he’s also written epic fantasy (Oath of Swords, The War God’s Own) other space opera (Path of the Fury, The Armageddon Inheritance) and alternate history (1632 series with Eric Flint), and much more: he estimates some forty-seven published or in-the-works novels. Weber and his wife, Sharon, live in Greenville, South Carolina. They have three children. His first published novel, Insurrection, was the consequence of some wargame design he’d done with his friend Steve White. They started exchanging short stories set in that world, and eventually realized they had a novel—which ran some 283,000 words in the first draft. That had to be pared down, but Baen bought it in 1989. Other books he mentions are (to Ed’s delight) the Swallows and Amazonsseries by Arthur Ransome. On the science fiction side, he mentions Heinlein’s juveniles, Andre Norton, H.Beam Piper, Mack Reynolds, Gordon R. Dickson, and Anne McCaffrey. Although Insurrection was his first published novel, his first submitted novel (rejected) was fantasy. That was Sword of the South, published just a year and a half ago or so. (The manuscript had been lost for years, but one of the floppy discs—one of the really big ones, using CPM and not DOS—turned up and then another, and an IT shop was able to recover the files “for a mere $800.” David rewrote it but says it’s still very close to the original novel. Most of the rewrite was to bring it in line with other novels set in the same universe. In university, David studied military and diplomatic history. “Forever and ever,” he says, he thought he would teach college history and write on the side, but as he was finishing up his Master’s degree he came across a study revealing that half or more all tenured positions were currently held by people forty or younger. He decide he should alter his priorities, and instead took over his mother’s small advertising agency—she’d retired to look after her own mother, then in her eighties. David sold Insurrection about a year and a half after that, and was fortunate enough to be able to support himself writing fulltime with eighteen months or so of making that first sale. While he has written passages and entire books he’s particularly proud of, for him, if the writing style becomes so important it begins drawing the reader’s attention away from the story, then the style has failed. David gives a synopsis of the Honor Harrington books, beginning with, “Honor Harrington is a six-foot-two-inch Eurasian martial-artist starship camera.” He notes the book both are an aren’t about Honor: she’s the focal point for most of the stories, but they’re actually about the series of wars she’s involved in. The first few books are very tightly focused on her, but as the war begins to spread, the stories take place on a broader canvas. There are a lot of secondary characters, “named characters,” David points out. David has been writing Honor Harrington books for twenty-five years. He originally projected the entire series to be eight books: there are currently seventeen novels and six anthologies, counting the collaborations. David said Jim Baen, publisher of Baen books, had noted that everything David wrote spawned sequels, so he suggested they try planning a series from the beginning. David sent ten ideas, one of which was the Honor Harrington series, one of which became his Safehold series (published by Tor), one the Multiverse series that began with Hell’s Gate, and one whose first book, The Golden Protocol, written with Jacob Holo, comes out in May. In fact, David says, he doesn’t think anyone else in the publishing industry has ever understood how to grow a new author’s readership so brilliantly. 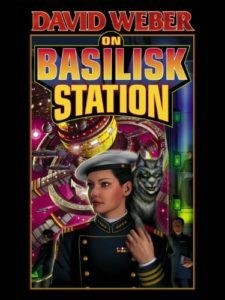 Another thing Baen created was the Baen Free Library, where free ebooks of some Baen titles were made available—which is where Ed discovered Honor Harrington. “I believe it did nothing but increase readership,” David says. Baen also used to bind CDs containing earlier books and a series and other titles into the back of new hardcover releases in series. Technology plays a major role in the Honor Harrington books. David said some of that comes from his background designing wargames, and some from the fact he’s been studying military and diplomatic history since he was ten or eleven years old. Before he wrote the first word of the first Honor Harrington novel (On Basilisk Station), he wrote an 80,000-plus word essay covering everything in the Harrington universe, from colonization to life sciences to technological history to politics. The technology was in part shaped by the story David wanted to tell. It was important, he said, that there be tactical constraints. “In a lot of ways, the story is about what you character can’t do, not what about what your character can do,” he says. “It’s about the limitations they have to work around. He decided technology would evolve over the course of the novels, and that technology would what would equalize the fight between societies where one was hugely outnumbered by the another. He also wanted technology that made tactics important, because he’s always been interested in tactics as well as the operational and strategic levels of military campaigning. “I needed a system that would give scope to a tactician who was smart, and one which would create limitations on how you could approach a combat situation.” Readers had to be able to understand the tactical situation, as well, in order to understand why characters did what they did. He notes that he wrote the first two books before the World Wide Web appeared, so some of his starting assumptions might be different if he was starting it today. Ed noted that descriptions of technology often appear within action scenes, creating an odd sense of suspense by delaying the combat climax. David says he thinks this goes back to the writer’s voice. He thinks he got the balance of hardware descriptions, descriptions of societies and political systems, and development of planets and cultures write because some people tell him they don’t like some of those but like others. Almost everyone says they love the characters. “The characters are the common factor,” he says. Some restrictions baked into the Honorverse are the impossibility of creating a self-aware AI (something David had dealt with in other novels and didn’t want to repeat), and the impossibility of faster-than-light communication—which means information can only move aboard courier starships. “That had very interesting and significant implications for military operations. You spend a lot of time going from point A to point B. It also means a huge amount devolves onto the initiative of the station commanders, the task force commanders.” This puts the situation back to about where Earth was in the 18th or 19th century, when nobody could micromanage their forces from Washington or London or Moscow. They didn’t even now there’d been a battle until a courier came back with news, which might be that an invasion force was close behind! “She’s constantly aware she represents her Queen and star system, and that informs a lot of her decisions.” That means it’s her job to face overwhelming odds even with little or no chance of success…and that’s one of the things that makes her beloved by those who have followed the books. Honor, in other words, is part of her character as well as her name (which David knew going). Her second name, Harrington, was a nod to C.S. Forester’s Horatio Hornblower novels, so that she would have the same initials. There are parallels between the Star Kingdom of Manticore and England, and apparent parallels between its rival, Haven, and the French Republic—but David says that latter paralle is a red herring, that Haven became what it becomes in the books not from a version of the French Republic but from a version of the United States, “if you look at their constitution.” David deliberately used his knowledge to create something that looked like the French Revolution within Haven—but really wasn’t. “I don’t know why people call me sneaky,” he adds. David says he uses history as a source of building blocks rather thanb an operating model. Although Honor is set in a space-going version of the Napoleonic era, his original thought was that it would more closely follow the Punic Wars, only with Carthage winning. That changed when he realized his version of space combat meant controlling space around a planet meant controlling the planet, and planetary combat would be vanishingly rare. “But I never intended the model I had built to be anything more than the starting point for cultures that had gone in different directions,” he says, so that readers would say to themselves, “iI know what he’s going to do here,” and then would be surprised when he did something else. That initial lengthy monograph David wrote for himself about the Honorverse spelled out what would happen in the war through what became Honor Among Enemies. Originally, he planned to kill Honor in what became At all Costs. However, Eric Flint, writing in the Honorverse, wanted something both a Havenite and a Manticoran secret agent could hate enough to collaborate, and David gave him the genetic slave trade. By so doing, he moved a plot strand twenty years forward without really being aware of it, which meant he couldn’t kill off Honor and have her children become central characters as he’d intended. David says the only character he did a detailed sketch of before he began was Honor—and even that wasn’t all that detailed in terms of where she finally wound up. He says he normally starts with a physical description and some aspect of their personality. As the character interacts with other characters and situations he goes back and adds notes. When he’s writing solo, he adds, he tends not to outline (although he’s done more in the last four or five Honorverse novels just to keep things straight, by creating a detailed timeline). When he does a collaboration, there tends to be a much more detailed synopsis of where the story is going, so there’s no confusion between the two writers. Now the big philosophical question: why does he write this stuff? “We are storytellers. That’s what we love to do. We love to create and craft stories. We communicate, we share those stories, by writing them down…I am fascinated by history, I am fascinated by the way that people’s personalities work, and how that motivates them to be who and what they are in real life. Telling stories lets me get inside that process…I honestly believe almost anyone could learn to love history if you could just get them to understand it is the greatest, most complex novel ever written. You have all of these characters, all of whom have their own motivations, their own responsibilities. How do they meet them? This is part of what makes us human beings, and defines the difference between responsible conscientious human beings and the predators. I think that I tell stories in part because that’s what I want to look at. “Obviously, I want to entertain my readership, and don’t want to be in the position of lecturing. But any writer, the moment he or she begins to write, steps up onto a soapbox. If I present a character who would be unsympathetic to you under normal circumstances, but I get you inside that character…the character’s views might not be those you would espouse on your own, but you discover that you like this character…then I have made those contrarian views more accessible to you, and I think that’s something we are, especially these days, in sad need of. “To me, that’s what being a human being is all about me. To me, good storytelling is about the human condition. 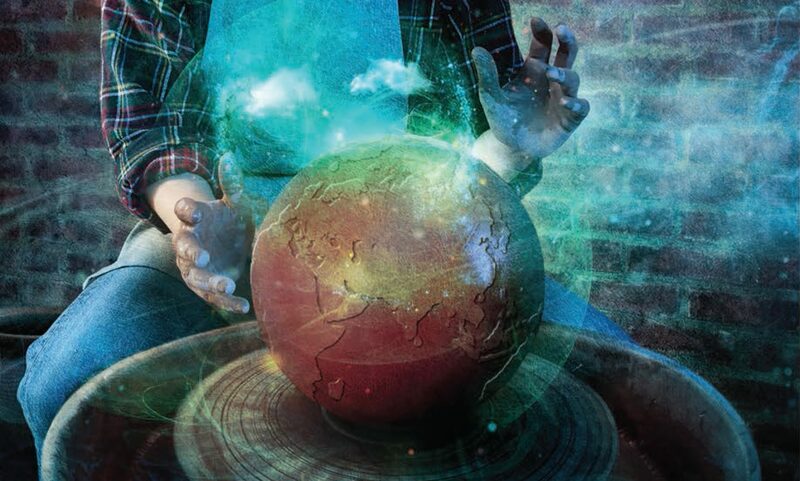 Science fiction is a technological age’s fairy tale. It’s inspiration, its cautionary, it’s explicative, it’s all of those things…instead of using demigods and demons and what not, we’ve got scientists and cyborgs and computers, but we’re looking at the same issues, the same questions: what makes us human, and what is involved in living up to your responsibilities as a human. Next PostNext Episode 13: Lee Modesitt Jr.